Department of Philosophy and Post Graduate Department of Public Administration of PGGCG-11, Chandigarh organised an One-Day Faculty Development Programme under RUSA on the theme “Dr, B.R. Ambedkar, Indian Constitution and Indian Society”. 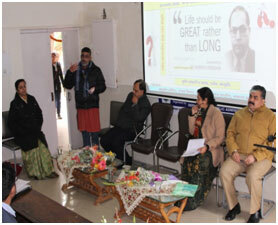 Several aspects of the philosophy of Dr. Ambedkar were discussed in the three sessions. More than 100 participants from Chandigarh and nearby states participated in the seminar. Dr. Ganga Sahay Meena from JNU, New Delhi was the key-note speaker. Dr. Lallan Singh Baghel, Chairperson, Deptt. of Philosophy, Panjab University, Chandigarh was the Chairperson for the inaugural session. The first session on “Socio-Political Philosophy of Dr. Ambedkar” chaired by Dr. Ashutosh Angiras from S.D. college ,Ambala Cantt. The second session under the theme “Dr, B.R. Ambedkar and Women Empowerment “was chaired by Dr. Emannuel Nahar, from Ambedkar Study Centre, Panjab University. Professor Binoo Dogra, Dean and Dr. Rama Arora, Vice Principal were also present on the occasion. Ms. Shashi Joshi proposed a vote of thanks. The programme was successful due to its vastness of content and deliberations by the resource persons and participants.